High Volume Semiconductor Photoresist Processing For WLCSP – The SCENE 12 and the SCENE 12-MAX. The next act in the advancement of resist processing systems, the Scene12TM for up to 300mm wafers (and the Scene8TM for up to 200mm wafers) provides more capability in less space at lower cost than any system from any manufacturer world wide. With the introduction of the SCENE 12-MAX™, S-Cubed has taken the SCENE 12 architecture to its fullest potential with more stacked processes, higher reliability, and lower maintenance requirements than ever before, while keeping overall footprint low. All Scene 12 machines are specifically designed for throughput and reliability in a high volume production environment. The Scene 12 processes wafers up to 300mm in diameter. Our system can instantly do recipe based interchange of 300mm and 200mm wafers and acheives perfect handling of flats on large wafer sizes. Bake, programmable pin height and fixed proximity combination. Reducing costs and downtime our hot plate does NOT require cleaning. Industry Exclusive precision wafer centering on the end effector at each wafer move, user programmable. The positioning takes place during the move. Tool teaches itself to center the wafer precisely at the spinners. 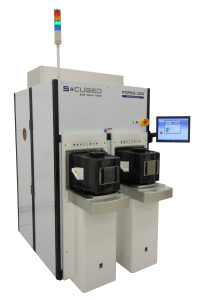 Built in metrology for wafer centering. For Coating and Developing films from 1 micron to 100 microns. Programmable temperature up to 180OC standard higher temperatures upon request. Built in film metrology unit. A 200mm load port can be provided so that Scene12tm can process 300mm and 200 mm wafers interchangeably with no operator involvement other than select process recipe and press “run”.